Shauna Reynolds was born June 6, 1966 in North Carolina & it's an odd coincidence that she has 666 in her birthday because Shauna is best known as White Zombie bassist Sean Yseult! Sean & Rob Zombie created a band that would define a sound, a genre & the music/art the 2 created forged a bond between them that not only made them artistic partners but also lovers who shared a long term relationship which sadly collapsed over the course of the monster that was White Zombie. Sean's father is Michael S. Reynolds who is a noted biographer of Ernest Hemingway & her childhood was an interesting exploration of culture, art & experiencing life as a freak. Sean recently put out a book entitled, "I'm In The Band" which is a joke title simply because many people didn't believe she was a member of a heavy metal band based strictly on the fact that in the 90's there were few if any females in metal bands. Sean gained the respect of the metal world due to her musical prowess & her onstage energy and I recently had the opportunity to interview Sean about all things White Zombie both past & present; Sean was very open, very pleasant & very candid. Rock N Roll Experience: "Why did you decide to release a book at this point in your life because your still young & will have more to tell as time goes on." Sean: I guess I could have put it out later (laughs), I had to dig through all my things in storage when I moved to New Orleans when White Zombie broke up & I just had everything in storage & I never looked at it all & just 2 years ago our management was putting together a box set of White Zombie stuff & they asked for some things out of my storage & I started digging through there & I just kinda stumbled across all these amazing photo albums & great tour diaries & all kinds of stuff it just kinda brought back this whole era that is so lost right now & it was just amazing, so it was just way to much to just contribute just a few things to the box set so I decided that I needed to atleast put my photos into a photo book or something & do something with that (laughs) and that's pretty much what happened. Rock N Roll Experience: I thought it was lame that you & J. had no involvement with the White Zombie box set. Rock N Roll Experience: "Have you & J. considered putting a band together post White Zombie?" Rock N Roll Experience: I've always though you should play with Zombie's old guitarist's band, SCUM OF THE EARTH. Sean: I haven't seen them, I'll have to check them out. Rock N Roll Experience: How did you and Danny Nordahl hook up? Sean: I was good friends with a girl named Brijette who had a band called New York Loose & we had been friends in the East Village & she had moved out to London for a little while & she had somebody producing them & working with them in London and she invited me to come and visit & I went out there and Danny was her bass player at the time so that's how we met, I was out there with Brijette for a couple of weeks & we met out there and we ended up dating for a couple of years...great guy. Rock N Roll Experience: Have you seen Danny playing bass for Faster Pussycat? Sean: Yeah...he's great, it seems like he's got a great little family there. Rock N Roll Experience: How come you & Rob Zombie never got married? Rock N Roll Experience: Was Sheri Moon essentially a groupie when she met Rob? Rock N Roll Experience: When you & Rob split wasn't it tough to be around Rob & his new girlfriend after you & him were a couple for so many years? Sean: It was a little rough, yeah, definitely. It wasn't fun for him when I was dating other people as well, but when we split up we both said we wouldn't throw it in each others faces but it's kinda hard when you're on a tour bus together on a tour moving from one town to the next all crammed together...yeah, it was....the difference was that I didn't insist that Al Jourgenson or whomever I was dating at the time, I didn't insist that they come out the entire tour the whole time like he (Rob) did to us & that was rough on the other member of the band too...it's kinda hard having another body around, there's not that much room & it's kinda weird for dynamics. Rock N Roll Experience: Did you date Twiggy Ramirez at one point? Rock N Roll Experience: It's funny that you mentioned the story about Gidget Gein from Marilyn Manson busting his head open at a show White Zombie played on because Gidget had told me that story when I interviewed him a few years ago. Sean: That's funny...those guys were great, I had so much fun with Marilyn Manson & it's ashame we never toured together....they kept going, "Take us on tour!" but look at them now, they didn't need our help! (laughs) They did pretty good on their own! I wanted to take them out though, that would have been fun! Rock N Roll Experience: What's the wildest thing that ever happened to you onstage? Rock N Roll Experience: Did you hook up with Sean from White Zombie? Gidget Gein: No, I wish, but she was like married to Rob Zombie at the time. 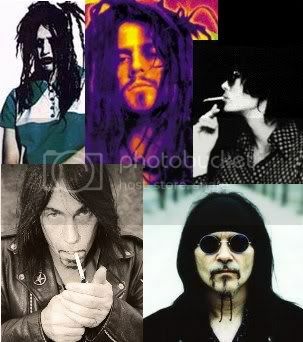 Rock N Roll Experience: Was Sean actually married to Rob Zombie? Rock N Roll Experience: I saw Lady Gaga's live show recently & she has a live rock band that backs her, would you ever consider joining the live backing band for Lady Gaga? Sean: God, you know....that's a good question....I don't know, it depends on; I wouldn't just do it for the job, & I have to be honest, I don't really know any of her music, so I'd have to hear the music & see if I could handle it (laughs), I'm not typically a fan of dance or pop music, but I do have alot of respect for her for being a freak & I love that she just f**king goes to the most extreme of anything she can do & it just kinda reminds me of our Early East Village days & everybody was kinda doing their own thing & being freaks, so....(laughs) I do have alot of respect for her on that level & like I said, I'd have to hear her music but I wouldn't just do it as a job. Rock N Roll Experience: I saw Rob Zombie on Extreme Home Makeover a few months back & my first though was, "Wow, Rob's really selling out! ", did you see that TV show & do you feel the same way because when White Zombie started it was satan & 666 whereas now Rob's on a TV channel owned by Disney. Rock N Roll Experience: Was there any unreleased White Zombie music? I'd like to thank Sean for taking the time to chat with me & definitely check out her new book, "I'm with the band" which is a fun read on the history of White Zombie with tons o' never before seen pics!